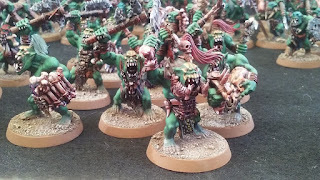 Last year I collected few boxes of Savage Orruk Bonesplittaz. 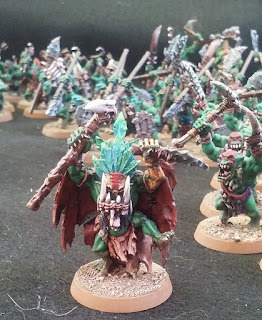 I'd thought about starting AoS and knew I had some old WFB orcs a goblins but it seemed to me a better choice to just start fresh, new game new army. It took roughly a month to get them all built and painted but that month was spread out over I guess 3 months. It could have all been done in a month but things came up. The goal was 1000 points I think I have more than 1500 points now. These are some of my best painted models. I'm thinking about adding a few more units and filling out a few of the units. And adding the characters I don't own yet. Awesome horde. Great blog, too. These are some of my best painted models. Thank you for the inspiration. 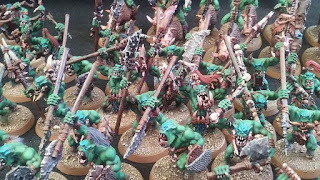 I've put aside my "k"s until the new edition, and have been knee-deep in an AoS Greenskin horde meself. HA! I usually paint to a high standard when I paint other peoples models and never finish my own. It's all a work in progress usually. 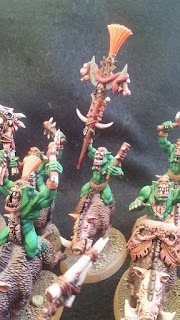 I had Orcs for wfb that I never finished I couldn't get myself motivated. It's hard for people who might see one of my armies at a game to believe I can actually paint if they don't know me already. 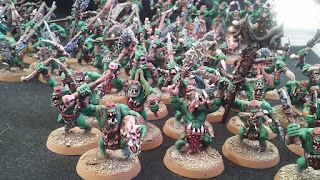 I've wanted to play with a fully painted army for a long time. I also figured they'd be easier to sell if I didn't/don't enjoy AoS. So far it's fun. Plan to head to the shop tomorrow for game. They have a league starting tomorrow If I can make it too the shop twice a month I'll join. I really don't play enough games these days. I'm thinking about one more unit of Boar boys, chompas and shields. 10 to 20 more Savages with Chompas and Shields and maybe 20 more bow guys. and the Heroes I don't have yet. But it's going to be buy a unit and get it done before I buy the next one. No reason to rush. I also want to make some Rhelm gates a big screaming skull face with a gate for it's mouth. "The Mouth of fire!" Sounds incredible. If you aren't a member yet, check out this site: http://www.tga.community/forums/ . It's a great resource, and unlike SOME places, it's really upbeat. I am now a member there. I didn't realize that tga was a thing. Should be good. I played my second game yesterday. It was a load of fun.Looking at what I'v collected and painted I'm now seeing what I might like to change and what I might like to add. I'm starting to see a few more kits in my future. haha. One of my friends who's very into AoS just moved and it doesn't sound like he can find anyone playing there. Luck of the draw I guess. Stay tuned, More savageness will be happening!